Share your photos on Instagram with the hashtags #fieldtripcargopants and #oliverands. This is a great pattern. It runs true to size and the instructions are very clear. I learned a number of new skills with absolutely no problems. Thanks so much! I borrowed this pattern from my mother to make my daughter a pajama top. What a fun, easy and quick t-shirt pattern! I didn't add the pocket, and made it all in one fabric, so it took less than 30 minutes to sew up once it was cut out. It's a great pattern with clear instructions, and I am told, very comfortable to wear too! I purchased this pattern because I wanted to start making shirts for my daughter, and it is wonderful! I've made three of them already with plans for more. The shirt is really simple and the instructions are clear. My daughter is very tall, so I adjusted a size 7 by adding an inch and a half to the hem and sleeves. I would definitely recommend this pattern if you are a beginner at sewing shirts - it will boost your confidence. My first pair of pants for my grandson. They turned out beautifully. Takes a bit of time to include the double stitched edging but it makes the pant. Boys love pockets & I had 3 different kinds to practice. These patterns are the way to learn sewing garments because of the clarity of the directions. Thank you. I enjoyed sewing these pants for my grandson. The directions were step by step and easy to follow. He looks so grown up in his cargo pants. I actually bought this pattern for my grandson, but needed to do something colorful after a rainy period. Why not, I asked myself, and made pink floral cargo pants for a granddaughter. There are lots of details to these pants, but they are easily explained. (Anybody needing practice with pockets should definitely try these.) As usual, Oliver & S is the pattern source I'll always return to. 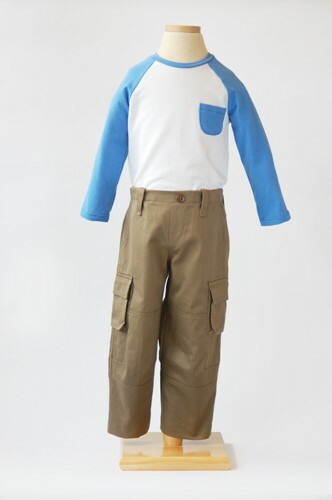 I made the T-shirt and the cargo pants and love this pattern. I am well pleased about the instruction. Thank you so much for the pattern. Absolutely wonderful patterns! I've now made them both, and will likely make them both for years to come. I will absolutely be buying the larger size range when my son grows out of the smaller. The tee is so simple and quick to construct, and while the pants aren't quick, they're not difficult. The extra topstitching, while time consuming, really makes these pants look professional. Next up: FT cargo shorts! I have used this T-shirt pattern for pyjama tops for my granddaughter, just adapting the length for ribbing cuffs and bottom hems. It's such a lovely fit, so superior to an older knit pattern I had been using. I particularly like the fit around the neck. I haven't made the pants yet, but looking forward to trying them soon for my new grandson! 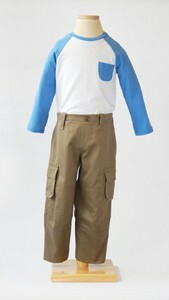 This is a terrific pattern for rough and tumble little boys. The shirt (of which I have sewn six) goes together super-quickly thanks to the raglan sleeve. It fits true to size though I find it useful to add a hair of length. My boy may just have a long torso, though. The pants take a little more time but the result is well worth it. One thing to note for those considering the pattern is that the knee is not actually reinforced with a second layer of fabric, rather it is pieced. It includes darts, I assume, for ease of movement at the knee joint. The pair I made for my son in sturdy twill have held up wonderfully despite his most spectacular spills, I assume in part because of the roomy knee. I highly recommend this pattern! I LOVE this pattern! it is easy to follow and sews up fast. I made these for my children before we went on vacation to Acadia National Park. I was stopped numerous times while hiking and asked where i bought them. These are now a new staple for my children :) I can't wait to sew more of these patterns! These are great pants! My son loves them, I make him 3-4 pairs each year as wardrobe staples. I don't add the cargo pockets simply because I'm too lazy, but I do include the front and back pockets and the belt loops. The instructions are great. My son is fairly large, and these fit comfortably. I reinforce just the front knee section with fusible interfacing and it makes the knees last much longer. I also sew them with an ample hem, so I can let them down as he grows (this way they last two years). They look very RTW. The pants are amazing. Once again, Liesl has taken a difficult concept and made it easy to follow with professional results. I love the outcome. Take your time and go slowly and the pants come together beautifully. I see making a lot more in my future. Love this pattern for little boys! Sized well and easy to follow instructions. I will use I over and over. Cargo pants and raglan shirt review. Very nice look, if you have the time to make the cargo pants. There are a lot of pieces, so it takes a lot of time to finish after cutting out . . . maybe an hour more than other pants. 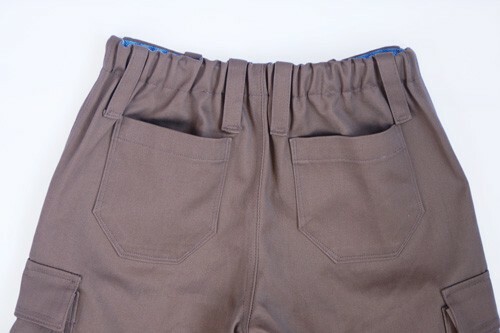 If you are adding a zipper onto the pants, there is a zipper tutorial on Oliver+S site. 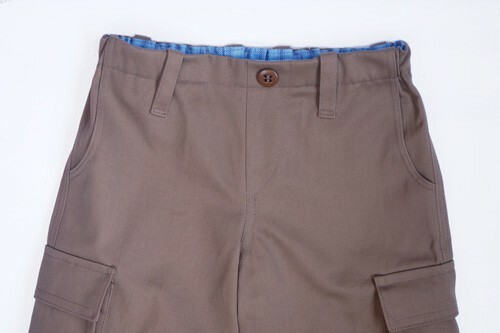 HOWEVER, the tutorial does not show how to finish the waistband or add a button, snap, etc. 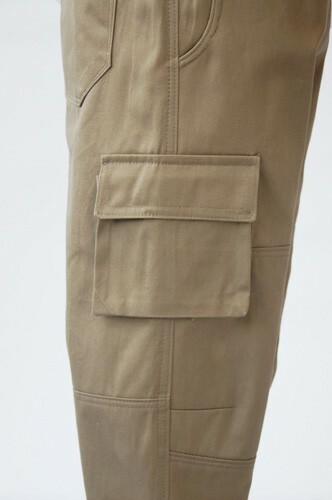 Neither does the cargo pants pattern, since the fly front is actually just for show (though convertible to a real one). You will have to look at other patterns or tutorials to figure it out. 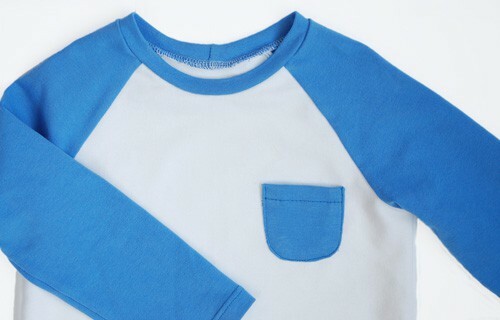 The raglan shirt is a really quick sew. It takes me less than an hour to make one. The assembly is clear and simple. Really, the raglan pattern is going to get the most use for me. It does seem to be designed with a 3/4 sleeve, so I had to extend the arm to make it wearable in winter. Despite any negative comments, I really like Oliver+S patterns. Instructions are clear and the patterns are thoughtfully designed. They _always_ look good when finished, even before fitting adjustments. There are no surprises, and I feel confident that I am doing the right thing. Plus, each pattern is a teaching tool, so you learn something that you can take to other sewing projects. ...and what a trip I'm taking this on! i am in the process of using the t-shirt pattern (sz 12) as a basis for some jackets... i trust o+s to be a solid foundation on which to riff! I have sewn up another company's raglan pattern and not been happy with the directions or shape, so it's a relief to have this one. My grandkids and I love these patterns! I haven't had a chance to make up this pattern yet, but I have sewn several things for my grandkids from some of your other patterns. My grandson loves the sandbox shorts, and my granddaughter looked so cute in the Pinwheel dress and tunic, and the ice-cream dress was an absolute favorite of hers. She would proudly say her Grammie made the dress for her when asked where she got it. I've also made the backpack and the vest in the Olive + s book and both were total hits with my grandson. I like working with Oliver +S patterns, they go together well and the instructions are always clear and concise. Thank you for your patterns and I especially enjoyed your sale the month of October. Look forward to more of those!! I bought 4 patterns and there are lots more I would love to sew!! In the printed version of the pattern and the first digital version, there was a minor grading error in Piece 3. The issue has been corrected in the digital version of the pattern now available on the website. If you would like an updated pattern piece for your paper pattern, you may download and print one in either the small size range or the large size range. Waist* 21" 22" 23" 24" 25" 26" 27" 28" 29 1/2" 30 1/2" 32" 33"
Discussion on the digital field trip cargo pants + raglan t-shirt sewing pattern from the Oliver + S Discussion Forums. Find and share more photos on Instagram using the hashtags #fieldtripcargopants and #oliverands.